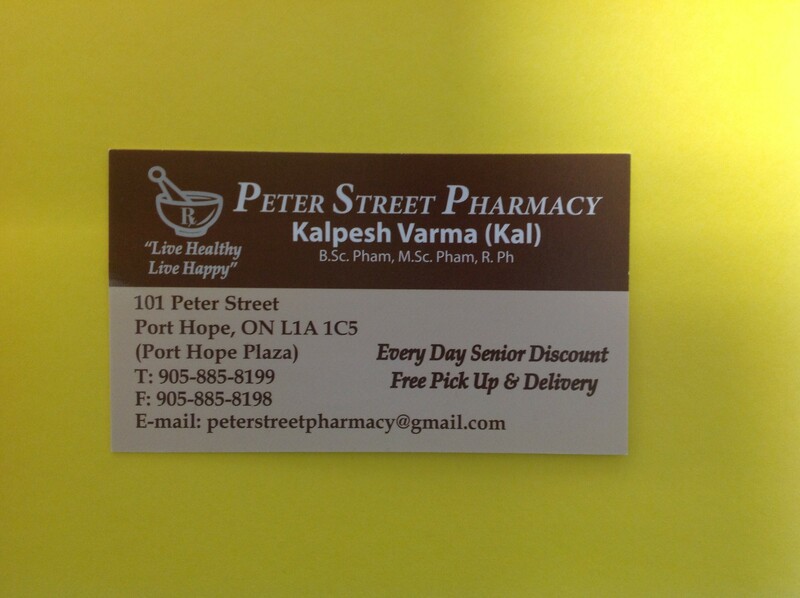 This general pharmacy is a great place to shop for basic health and home products, health care supplies. This pharmacy does blister packaging just ask them. Also, has FREE medication disposal and FREE local delivery. Cobourg Spine and Sports Injury Clinic offers the latest and most up to date techniques and therapies to ensure the best care possible. Our thorough and personalized approach ensure patients are receiving optimal care that meets and exceeds their individual needs. Whether you’re a seasoned athlete, a weekend warrior or simply looking for optimum wellness, Cobourg Spine and Sports Injury Clinic offers the best chiropractic and sports injury care available. Our massage therapy is second to none offering sports-related therapy as well as relaxation techniques. Fitness Frenzy is not just an average workout facility Becky also offers holistic coaching and training. Focusing on the important roles that sleep, food quality, and stress reduction techniques play in improving your health. They teach you practical methods that initiate valuable lifestyle changes to create growth in the mental emotion, and physical body, including increasing vitality, decreasing stress and sculpting the body. If you would like to improve your health from the inside out, this service is for you! As Newcastle’s first Hearing Health Clinic we strive to offer the residents of the Village of Newcastle and surrounding areas the highest possible quality of care and service. We opened our doors in 2011 and the response from the community has been overwhelming. People have been so pleased with our level of care that they have been referring their friends and family members, many from over an hour’s drive away! Located in the historic Massey Building across from Foodland, our professional team is prepared to work with any and all hearing aid models to ensure they are providing the greatest assistance possible. 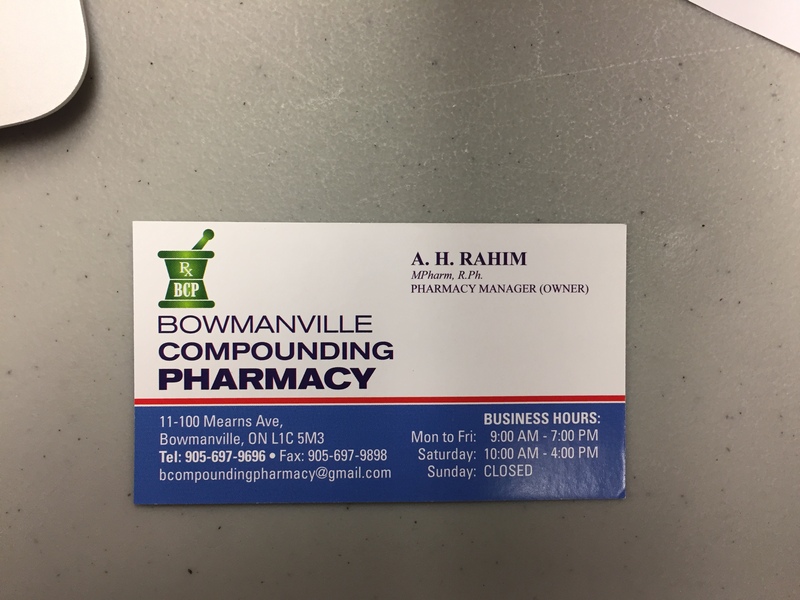 This general pharmacy is a great place to shop for basic health and home products, health care supplies. This pharmacy does blister packaging just ask them. Whether it be sunglasses or eyewear, your kids, friends, a family photo, or a selfie – we want to see you smiling in your Spects. 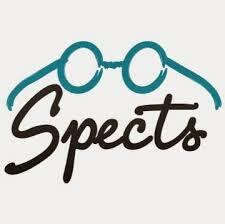 Spects will take care of all your optical needs. Glasses, sunglasses, contacts, eye exams, etc! We even have Yoga Services! Give us a call anytime! Dr. Amit Sharda and the SpineWise team have been serving Bowmanville, Newcastle, Orono, Courtice, Oshawa, Whitby, Pickering and the surrounding areas for 2 decades. Our welcoming team at SpineWise are committed to providing solutions to address your unique needs, whether you are experiencing back pain, neck pain, headaches, or even muscular tightness and tension. You may be searching for pain relief after an accident, experiencing an injury, or if you suffer from a specific condition like chronic back pain or a spinal condition. Even if you looking to improve your overall health, our team can help you attain your everyday wellness goals! Dawn is the sole Esthetician and owner of Starting Point Massage and Esthetics. We have been accepting new clients since July 2015, and have just expanded our location into the Midtown Mall, Oshawa. We strive to make each experience at the Studio as unique & individual as our clients. Whether you are looking to perfect your skin through a series of AFA Peels, Microdermabrasion, facials, hair removal, a dermaplaning facial, or just want to take a load off from your hectic day during a half hour relaxing body treatment, we strive to make each service your best experience yet. Our natural healthcare services are customized to address the needs and concerns of each individual. Synergystix, Partners in Health, provides massage therapies, colon hydrotherapy, and one-on-one fitness training in a relaxed comfortable setting. TRACY LAFONTE’S SKIN LASER MED SPA INC.
With a passion for quality service and innovation, we are committed to exceeding the expectations of our clients. Our vision is to help you look and feel your best. We do a range of skin care options such as; anti-aging secrets, laser treatments for skin damage, hair removal, Botox, Restylane injections, Obagi, skin tightening pearl fractional acne therapy, and much more. T-Zone Health is a division of the T-Zone Group of companies. Our specialty is Whole Body Vibration – a product that has revolutionized the health and fitness industry. It is heavily researched and demonstrably the most important product that has been produced in our memory. 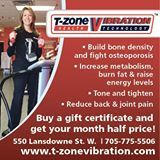 T-Zone is one of the pioneers in Whole Body Vibration in Canada – we are the largest in the country. Our machines are produced for the home and professional market and currently used by hundreds of outlets including chiropractors, physiotherapists, personal trainers, sporting clubs, nursing homes, retirement centers, and much more. Stony Lake spa offers registered massage therapy treatments to guests staying at Viamede Resort as well as cottagers and visitors in the surrounding area. Sixty minute appointments with a Registered Massage Therapist will be available during July and August and by appointment only throughout the year. 595 Mount Julian Viamede Rd.